The green and blue lights are up in Brick Lane and it is the month of purification, fasting and devotions. There is an uncharacteristic hush among the residential streets of Spitalfields and, appropriate to the season, at the Taj Stores they are selling these exquisite little baskets of delicious dates (£7.99), as a traditional and healthy restorative for when the time comes for you to break your fast. Yes, dates. I’ve become a bit of a date fan. The best ones, according to the Saudis, are half-yellow, half-brown. The yellow part, which is unripened, is crunchy and nutty. The brown part is the more familiar sweet and chewy texture. They complement each other marvellously. 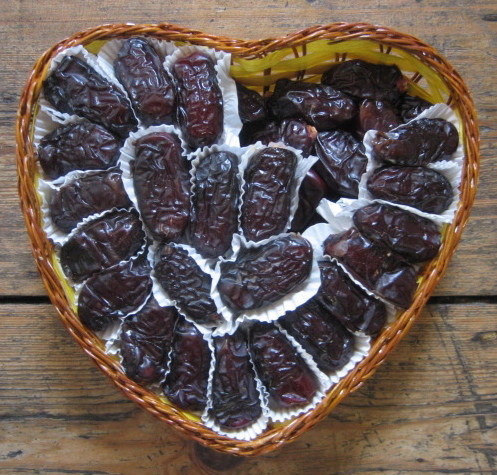 But you need to RUMMAGE in your basket of dates to get the good ones: It is rare to find the date which is perfectly balanced.